You've found the rug you want - the pattern, colour, and texture is perfect for your home. But how big should it be, yet still be in keeping with the scale of your room? Where should it be laid? How do I measure up? Our size & fitting guide provides several helpful tips on how to get the best look. Typically larger rugs will create a feeling of order and calm; whereas smaller rugs can divide a room but are suitable for a variety of situations. For plain or muted tones, a larger rug can work better, whereas a larger rug featuring vivid colours and a busy design can be potentially overpowering. A rug lets you define a particular area within a room, usually an area for relaxation. 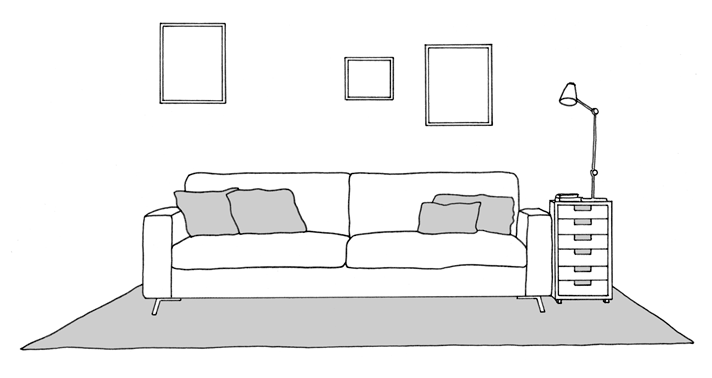 So, instead of laying your rug in front of your sofa, creating a dividing line between room and sofa – lay it underneath. Just halfway is enough to make your sofa and rug appear as a single design statement, and to make the sofa seem even more inviting. Also make sure your rug extends generously to either side of your sofa. Too little, and your furniture will feel cramped within the space. Another typical and highly effective arrangement is to lay a rug between two sets of facing seats, often with a low table in the middle. Laid out this way, your rug creates a sense of intimacy. It defines the space as somewhere special. Determine if your rug extends beyond the seating at either end. The extension draws your eye into the space and makes it seem bigger than it is. To unify a room, you will often need a large rug – large enough to accommodate your furniture and leave a generous margin beyond. If your furniture is too close to the edge of the rug, the effect looks cramped – as if your rug is tugging everything together. Furniture that stands next to walls is trickier to deal with. The best solution is to leave it off your rug. Having some items of furniture wholly, and others partly, on your rug destroys the symmetry. You will lose the sense of unity. When laying a rug beneath your dining table, you make a point about its centrality to family and social life. A rug emphasises that this is a shared space for food and laughter. As before, be generous with your size. You'll need a rug that's larger than your table by at least 0.75m on all sides. Be sure that diners can get in and out of their seats without their chair legs slipping off the edge of the rug. If your rug is too small, it'll catch their chairs every time. A rug also dampens the sounds of chair movements – and the occasional item of dropped cutlery – scraping on hard floors. A rug can make your bed look even more intimate and inviting. It's also thoroughly soft underfoot when you step out first thing in the morning. So choose a rug that gives you a sufficient margin to walk comfortably around your bed. For a unified look, extend the rug back as far as the headboard and make it wide enough to incorporate side tables. If that's beyond your budget, stop short of the side tables. But make sure you can still put your feet down when you get up. 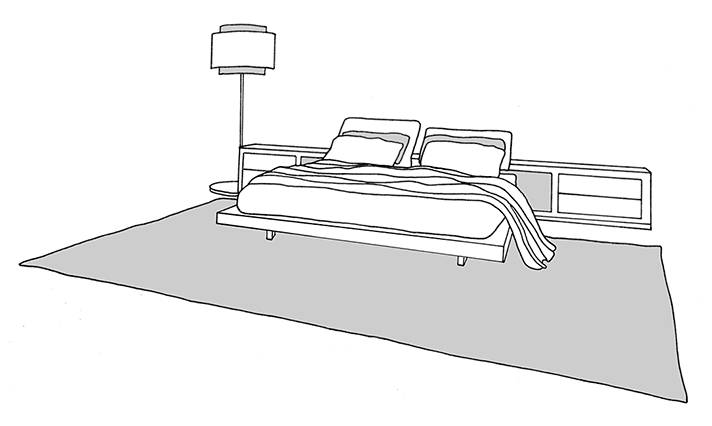 Simplest of all: lay a pair of narrow rugs on either side of your bed. The easiest way to measure up for your rug is to run a tape measure directly across the floor. It will help if you mark out your rug shape first to see how it looks, and to check that you have enough room to stretch your feet or shuffle chairs around. Use lengths of string to show how far your rug would reach, and then move the strings around till you achieve the effect you desire. If you wish to think about it for a day or two, you could try marking chalk lines on the floor. But don't mark your carpet till you know you can easily remove the chalk. Test it on an inconspicuous patch first. An even better way to take the guesswork out of rug-sizing is to fold a blanket or dust sheet to your chosen size, and lay it on the floor. Leave it in place for a few days to get a feel for what works best. Experiment with different widths and lengths – and with different furniture configurations until you discover the most pleasing layout. A hallway or landing runner will look at its best when it runs the full length of the passage, and less likely to cause trips. The width requires consideration - your rug should be wide enough for one person to stroll along it comfortably without having to consciously keep to a straight line. Allow for a walker's natural sway. If your hall is wide enough, consider a rug that allows two people to pass with ease. Carpeting a staircase with a runner or with wall-to-wall carpet is a job for a specialist. Call in a carpet fitter first. They can tell you what size you'll need and they'll give you a quote for fitting it..
A carpet is essentially a rug that fits your room from wall to wall. In practice you need to order a rug that's bigger than your room by at least 200mm in every direction. It's better to get a carpet fitter in to measure because they can also give you a price for fitting. And they'll know exactly how to take account of irregularities such as recesses and rooms that aren't exactly square. You should also talk to us before you order anything that has to fit a room or staircase exactly. We can help you align your rug pattern with your room.